The What: WyreStorm will demonstrate the SW-0402-MV-HDMI and SW-0402-MV-HDBT Dual 4K Output HDMI and HDBaseT multiview scaling switchers at its InfoComm booth, N2613. The What Else: The SW-0402-MV presentation switchers for dual 4K output multiview scaling or 4x2 matrix switching enable four analog and/or digital AV inputs (12 sources) to be shown in full resolution on a single 1080p or UHD 4K display. The SW-0402-MV-HDMI and SW-0402-MV-HDBT are designed to handle multitasking with ease, with four-input to two-output scaling, three-in-one HD/UHD video processing, and matrix switching over HDMI for local distribution or using HDBaseT for transmission over distances up to 35 meters (115 feet) for 4K and 70 meters (230 feet) for 1080p. Both HDMI and HDBaseT models enable up to four analog and/or digital AV sources to be displayed and switched simultaneously in full–screen, dual-view, tri-view, or quad-view mode on up to two HD or UHD 4K screens. Inputs can be switched, scaled, and presented in full resolution simultaneously on a single HD 1080p or UHD 4K 2160p display, with customizable PiP configuration allowing for nearly limitless layout options. 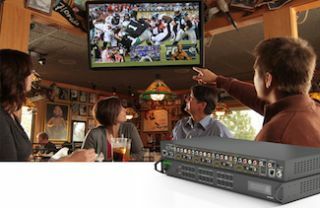 Input source connectivity includes HDMI, VGA, or component (CVBS/YUV), with additional audio inputs via stereo mini jack and RCA LR audio for embedding the video with an external audio source, and two assignable, independent HDMI outputs that can be mirrored when in multi-view mode for transmission to two screens simultaneously or independently when in 4x2 matrix mode for separate switching between each screen. Matrix mode also supports quad-view scaled to 4K or 2K output, with assignable S/PDIF for equally independent audio routing. UHD 4K and HD Multi-View Video Processor modes enable any/all four HD/SD analog and digital sources to be scaled, rendered, and arranged in any size or order on either connected HD 1080p or UHD 2160p display. Users can select PiP mode with any source selectable as the fullscreen background image, and three PiP displayed in any configuration anywhere on the screen or quad-view with all four sources displayed in a 2x2 grid formation, with sources able to be selected, resized, and moved anywhere within the screen in real-time, while determining which incoming audio signal should be routed to the two S/PDIF audio outputs. Units are controlled via front-panel push buttons and an LED display, TELNET, or serial control with RS-232 input and loop-out connectivity and drivers available for major control systems. Both models are cascadable and can be daisy-chained together to create large, easy to control seamless switching or multi-view system environments of almost any size, such as multi-view of 8x4 for 32 individual windows (video channels) to be displayed on single video wall. In 4x2 Matrix Mode, HD/SD content from analog and digital inputs can be upscaled and fed to each independent display zones. And WyreStorm QuickSync technology allows sources to be seamlessly switched between either connected HDMI output without delay/image freeze/blank screen, making the SW-0402-MV-HDMI and SW-0402-MV-HDMI two of the fastest presentation switchers available.